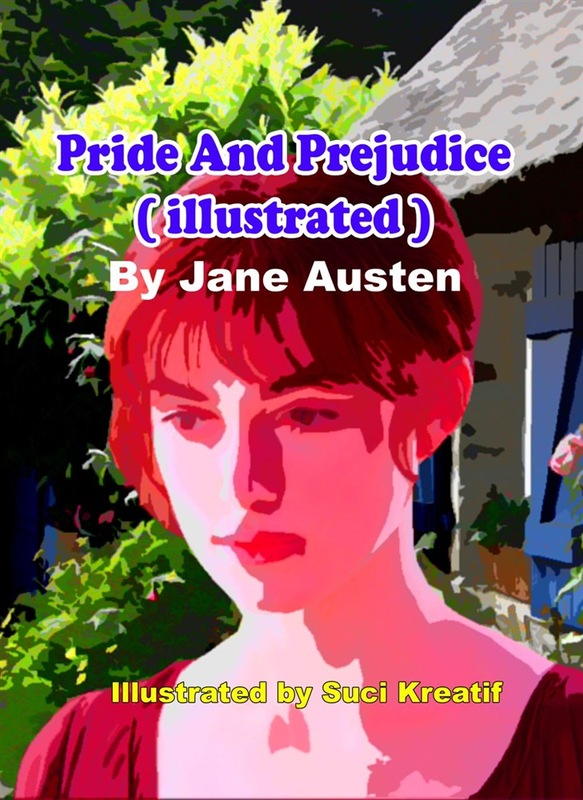 PRIDE AND PREJUDICE ( illustrated ) book provides a reader with illustrations to interact with Jane Austen novel. The reader can appreciate the novel with striking illustrations. Cover illustration was inspired by artists for added interest the reader to know the end of the story Jane Austen novel. Cover illustration produced by one of the portraits main character-Elizabeth Bennet There are a few illustrations have been made to make this a really interesting novel. The editor also believe that illustrations can help reader develop critical thinking skills, as their brains take in the illustrations and the text and make connections between the two.When reader read books with illustrations, they are able to envision the story in a way that helps them relate to the characters. Illustrations also enable the reader to explore the world within their imagination and make connections between what they have just read and a visual image. When a reader connects what they have read with pictures, it can make the book more real to them. Illustrations are powerful ways of helping this novel come alive. NOTE: - The new structure of chapter headings in the novel. They are added here by the editor to assist the reader. - This Book follows the original text. - Illustrate produced using computer design Pride and Prejudice is an 1813 romantic novel by Jane Austen. It charts the emotional development of protagonist Elizabeth Bennet, who learns the error of making hasty judgments and comes to appreciate the difference between the superficial and the essential. The comedy of the writing lies in the depiction of manners, education, marriage, and money during the British Regency period. Pride and Prejudice is a humorous story of love and life among English gentility during the Georgian era. Mr Bennet is an English gentleman living in Hartfordshire with his overbearing wife. The Bennets 5 daughters; the beautiful Jane, the clever Elizabeth, the bookish Mary, the immature Kitty and the wild Lydia. Unfortunately for the Bennets, if Mr Bennet dies their house will be inherited by a distant cousin whom they have never met, so the family's future happiness and security is dependent on the daughters making good marriages. Life is uneventful until the arrival in the neighbourhood of the rich gentleman Mr Bingley, who rents a large house so he can spend the summer in the country. Mr Bingley brings with him his sister and the dashing (and richer) but proud Mr Darcy. Love is soon in the air for one of the Bennet sisters, while another may have jumped to a hasty prejudgment. For the Bennet sisters many trials and tribulations stand between them and their happiness, including class, gossip and scandal. Mr. Bennet of the Longbourn estate has five daughters, but his property is entailed, meaning that none of the girls can inherit it. His wife has no fortune, so it is imperative that at least one of the girls marry well in order to support the others upon his death. Jane Austen's opening line, "It is a truth universally acknowledged, that a single man in possession of a good fortune, must be in want of a wife", is a sentence filled with irony and playfulness. The novel revolves around the importance of marrying for love, not simply for money, despite the social pressures to make a good (i.e., wealthy) match. Acquista Pride and Prejudice ( illustrated ) in Epub: dopo aver letto l’ebook Pride and Prejudice ( illustrated ) di Jane Austen ti invitiamo a lasciarci una Recensione qui sotto: sarà utile agli utenti che non abbiano ancora letto questo libro e che vogliano avere delle opinioni altrui. L’opinione su di un libro è molto soggettiva e per questo leggere eventuali recensioni negative non ci dovrà frenare dall’acquisto, anzi dovrà spingerci ad acquistare il libro in fretta per poter dire la nostra ed eventualmente smentire quanto commentato da altri, contribuendo ad arricchire più possibile i commenti e dare sempre più spunti di confronto al pubblico online.